Is your water bill unusually high, or do you hear the sound of water running but no visible water to be seen? If yes, you may soon be getting a letter from the city stating your home is consuming an unusually large amount of water. Many Homes here in Southwest Florida have the hot and cold water pipes installed under your homes slab. A quick check of your water meter will tell you if there is a leak at your home. First, turn off anything in the home that may have a small drip or leak like toilets and faucets. Then be sure nobody is running water inside the home while you check the meter. In the middle of your meter near the numbers you will see a triangle or multi-prong disc. You can have someone inside turn on a faucet while you are looking at the meter to identify the disc that moves. This disc or red triangle should stay steady or not move with everything off and no one running water. If the disc is moving you have a leak somewhere past the water meter. If you feel uncomfortable with performing this task, please don’t hesitate to call the professionals at Moen Brothers plumbing & Drain, We have several tests we can perform to isolate where the leak is coming from. 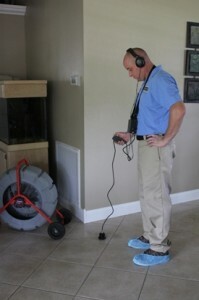 We have the proper slab leak detection equipment to listen for leaks under the floors of your Ft. Myers or Naples home. When the leak is found we will make recommendations on either repairing the leak or re-routing the pipe. If you have had similar leaks in the past, you may consider re-piping your home. Paying for several Slab leak detection visits and slab leak plumbing repairs in Fort Myers,Estero,Bonita Springs,San Carlos Park and Naples, FL could add up to more than a complete re-pipe would cost.